● SLEEP BETTER by Blocking the Blue Light that controls our Melatonin. 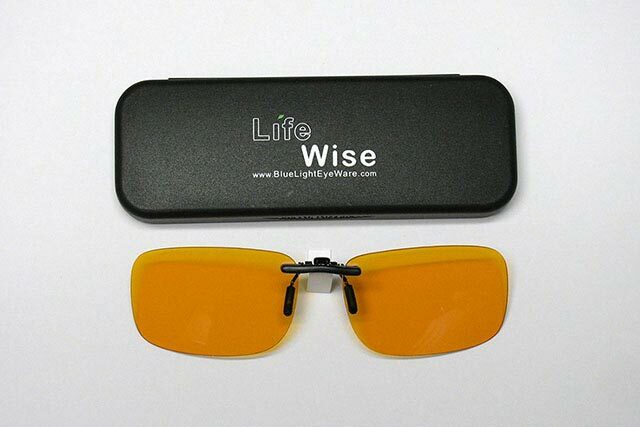 Goggle type glasses with fitted yellow lenses with Blue Light Reflective coatings to be more selective in Blocking just the Blue Light (95% @470nm). 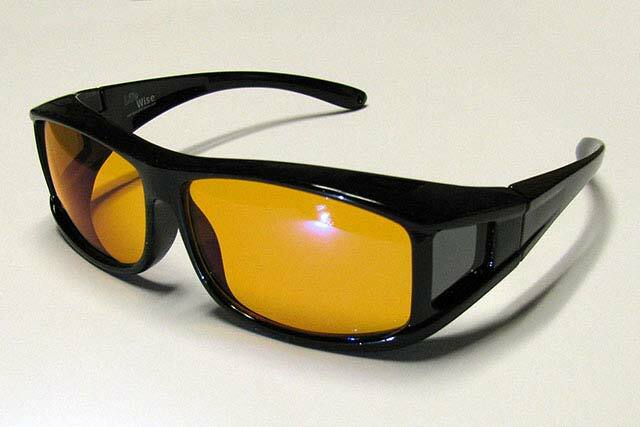 They have better optics and are comfortable to wear as they allow more light of the other colors that do not hinder our melatonin production. ● They have enough room to permit most prescription glasses or reading glasses within them, but were not designed to fit over such. ● The goggle type design is to block peripheral Blue Light from the eyes as most of the home lighting emits high levels of blue light. ● UV protection, Electromagnetic Radiation Protection, Anti-Fog & Scratch resistant design. ● RECOMMENDED as NIGHT DRIVING GLASSES. ● Clip-Ons that use the same quality Blue Light Reflective coatings as the above glasses but are designed to clip-on to prescription glasses or reading glasses. ● Larger than most standard clip-ons 41 mm. (1.6 inches) high to cover most glasses and provide a bit more peripheral light blocking. As shown they come with a protective case. ● UV protection, Electromagnetic Radiation Protection. ● PROTECT YOUR EYES from High Energy Blue Light emitted by digital devices such as TV, Computers, Smart Phones and modern lighting and reduce EYE STRAIN. Reduce the onset of Macular Degeneration or the progression of AMD. ● Goggle type glasses with fitted clear lenses with Blue Light Reflective coatings to partially block just the Blue Light (35% @470nm). They have better optics and are comfortable to wear as they allow more light of the other colors that do not hinder our melatonin production. See our FAQ Page for more information and instructions as to when and what type to wear. There is a lot of evidence and research to prove the above claims, see our Research Page. 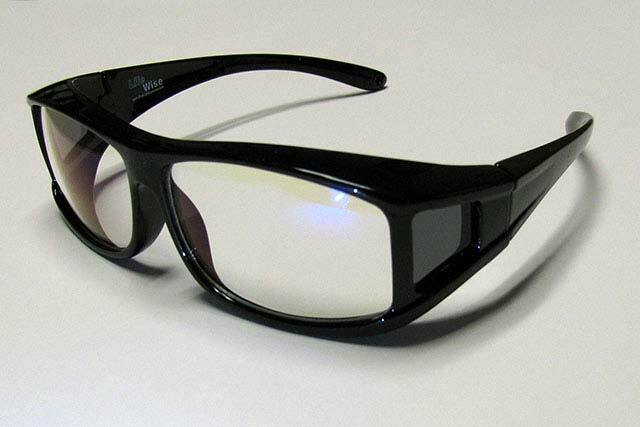 1: We are Different than most other suppliers of BLUE BLOCKERS in that we have the equipment to test our glasses from the manufacturers to Verify they Block Blue Light at the circadian sensitive wavelengths. 2: USA (lower 48), Canada, Switzerland and most of Europe only, limited time offer.